If you’ve installed our Gallery plugin, with this widget you can display your recent galleries in a variety of styles, so your users can enjoy viewing your images. This widget comes in handy when you’d like to show all your works / galleries in your home page, or in any widget area in your site. Title: Add a title to be shown above the list of galleries. Style: Select the style in which you would like to display your galleries. Note that the styles change from theme to theme. 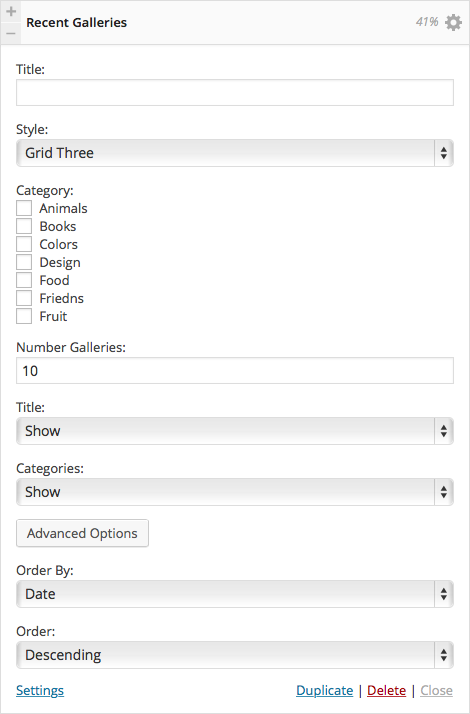 Categories: Select out of all the categories which of them contain the galleries you’d like to display. A great way to filter galleries you don’t want to be shown in that specific page. Title / Category – Show / Hide: Choose whether you’d like them to be shown in the widget or not. Order By: Set the order in which you’d like the gallery to be displayed. By date, menu order, title, author, post slug, modified, comment amount, post ID, random or none.